SIGN UP FOR LOYALTY REWARDS HERE!! Pools N More is celebrating 25 years of serving Lima, Ohio and the surrounding areas, transforming your back yard into a vacation dream land. From quality above ground pools to energy efficient hot tubs, & American made pool tables we meet your entertainment needs. 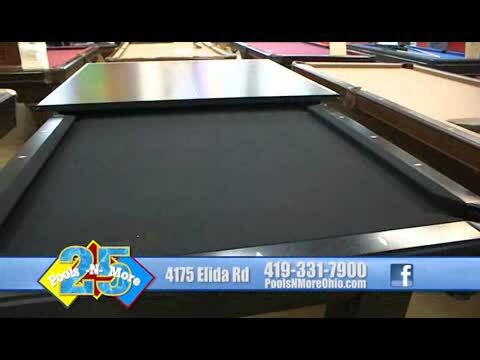 We offer a large selection of quality pool tables as well as accessories to keep you on top your game. Think you can't use a hot tub in the winter?? Winter is the most popular time of the year to sit in an outdoor spa. Your body temperature rises while you relax in your hot tub and you won't even notice the cold when you get out. Relaxing in a warm, comfortable hot tub, while large snow flakes fall is a feeling like none other. And of course, DON'T FORGET TO VISIT OUR CHRISTMAS WONDERLAND. Come join the Fun - YEAR ROUND! !